I just printed this!! Its now working again, but hurry, dont know how long it will be. 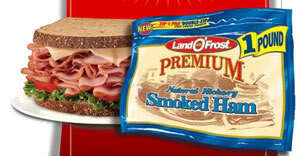 Land O’ Frost has come out with a high value lunch meat coupon. Go here to print off a $2 off any one package of Land O’ Frost Premium. Make sure to press the back button after printing so you can print it twice. I just printed two, on the blog it says they have added more so try again! I had the same problem, I tried 3 times and it kept telling me I had reached my limit, but I’ve never printed the coupon. Hmmm…says I’ve already printed the coupon, when I haven’t…maybe it’s gone already?